Imagine the following scenario: you just started a project that you are very excited about. You meet the client, and you both agree that your first task will be conceptualizing and planning of the course’s content. Meeting #1: Even though you had sent some of the project’s advances ahead of time, the client has just read them. He says that that's not the idea he had in mind and explains how he’d like the project to be restructured. Meeting #2: You did your best to prepare something close to your client’s expectations, but he says he has new ideas and proposes a change to the project. You accept these changes and begin working on the project again. Meeting #3: You both meet again, and the client goes over your work. He gives you some ambiguous feedback and notes that it has taken a long time for such a little progress in the project and asks you to return to the original idea. Three months have passed, how would you feel? Even though it’s not directly your fault, you didn’t meet the project’s goal, and you feel FRUSTRATED. Frustration is an emotion that can eventually lead to a lack of motivation and the abandonment of goals and projects. Frustration is, unfortunately, a very common emotion for those who are facing a new way of learning without the right tools and knowledge. eLearning, as a fairly new way of learning, provides us with a multitude of new opportunities, but also presents difficulties that may discourage our online students and prevent them from meeting their learning objectives. Federico Borges (2005) identified that student frustration is caused by shortcomings in various training factors, such as: company culture, learning strategy applied, the person who designs the material, and even the student himself. As an online student and instructional designer, I have decided to write a blog post on this important subject, integrating my experiences in both roles, because I believe that identifying the reasons for frustration will allow us to eliminate obstacles that obstruct students’ learning. E-Learners: Why do they become frustrated? Have you taken eLearning courses that you didn’t find useful? This can happen when the course has a different level of knowledge or expertise, either because the concepts are too advanced or too simple, or maybe because the topic simply does not help you with the daily tasks and challenges you face at work. Bottom-line: if the learner doesn’t see the course as relevant and practical to their real-life challenges, he will become frustrated. To avoid this, eLearning professionals should avoid the one-size-fits-all approach. Most companies just create a bunch of courses for everyone in a haphazard manner, and this can definitely frustrate learners. Most online students believe that eLearning requires less effort that face-to-face training. This is false. Online learning requires just as much effort as any other type learning. It even requires the student to have certain technological skills that enable them to press certain buttons and find what’s needed. Most e-learners tend to procrastinate and leave an online training session until the last minute because they think that they’ll complete it in no time. People think that they can invest very little time in online courses and finish them quickly. This is wrong! When we are not very familiar with eLearning, we must consider that it will require time to learn to organize and manage our activities. We must dedicate sufficient time in a relaxed environment that allows us to concentrate. Instructional Designers: Why and How Do They Affect the Learner's Frustration? 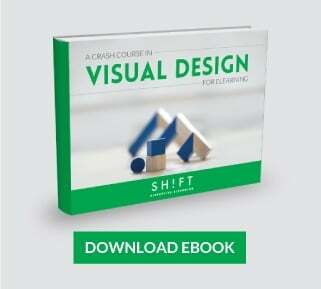 Do you design online courses without ever having taken one yourself? What are you waiting for? It is essential that you authentically experience what being an online student means. This will help you understand the elements that are really involved in the learning process, the skills you should evaluate, and how to interact with the content. Note the different student profiles. Those who are learning the new system obviously will go through a period of crisis and adaptation. Those who have taken online courses a while back will have to brush up on certain skills, and those who have taken online courses may not have experience with the new training platform. The fact is that clear instructions are essential. Not knowing what to do or not understanding the steps they need to follow is overwhelming. Don’t assume that just because learners have taken an online course before they don’t need clear instructions and information. If you give clear instructions to your students, their level of frustration will decrease considerably. Imagine sitting down at a computer to complete an eLearning course and instantly feeling overwhelmed and frustrated with the amount of information that is being thrown at you all at once. Many employees that participate in eLearning courses report this as a complaint. Too often, they are inundated with information at one time and the course quickly feels more like a lecture and becomes significantly less enjoyable. Put yourself in your students’ shoes, consider their workload and think realistically about how much time they can actually dedicate to taking a course. eLearning courses aren’t supposed to be eBooks, and the learner's mind needs time and space to learn. Are you under the assumption that your online students don’t need to interact with others because they are taking a self-paced course? You’re wrong! Never forget that learning is a process of creating knowledge in which interacting with others to share information and different points of view is enriching. Make them feel like they are part of a community. By not promoting interaction, students feel isolated, unmotivated and FRUSTRATED. 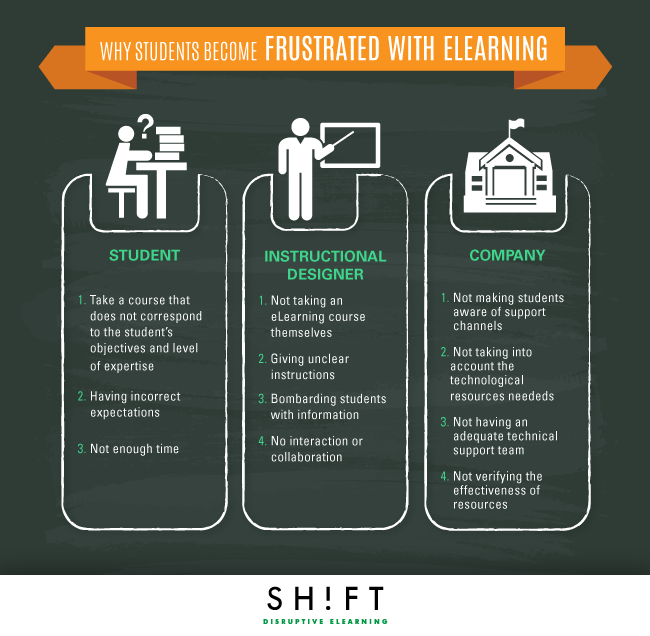 Company: Why and How Do It Affects their Learner's Frustration? It is common for companies to forget to tell learners where and how to get help, whether in relation to administrative aspects, learning content or your training plan. Making learners aware of this from the get-go can help resolve problems early. Minimally, the student must know: their account information, how to access the training and how to use it. Although it seems obvious, some companies don’t take into account what their students will need when they take a course. Make sure students are aware of basic system requirements like computer specifications, minimum Internet speed, required phone features, etc. It is necessary to take all these elements into account and for the company to provide students with any requirement that they don’t have. Lacking of any of these resources or requirements can be an insurmountable obstacle and can cause the student to feel frustrated and unmotivated. The training manager is not always the best person for dealing with technical issues. There needs to be a specialist that offers different support via email, phone, messages, etc. This tech savvy person or team should be friendly, patient and have enough knowledge of computer programs (duh!) to help the student tackle their problem. 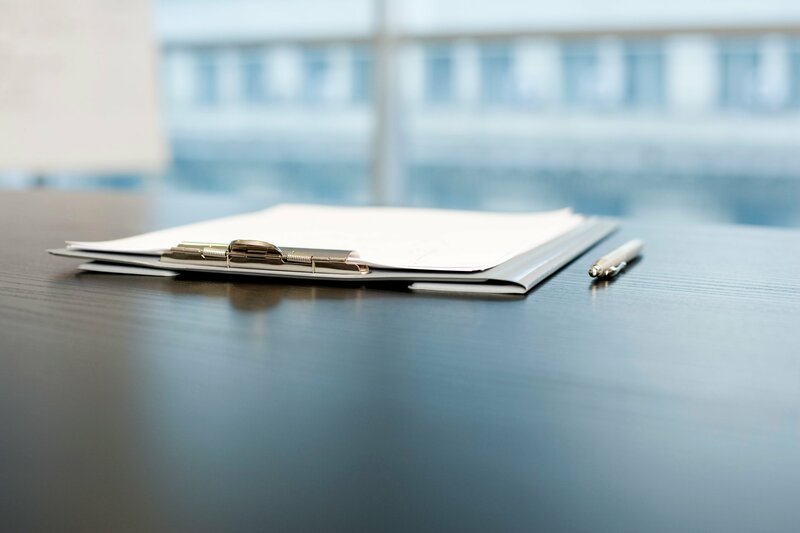 *Note that the company must provide a sufficient budget and staff for this task. Before launching the materials, companies need to make sure that the materials will be read and displayed properly, that they have relevant content, that the format is appropriate and that the usability is intact. Take note of these elements and make your own preventative action checklist. Help your students and don’t make their first eLearning experience a frustrating one! BORGES, Federico (2005). «La frustración del estudiante en línea. Causas y acciones preventivas». Digithum [artículo en línea]. UOC. N.º 7. [Fecha de consulta: 03/08/2015].